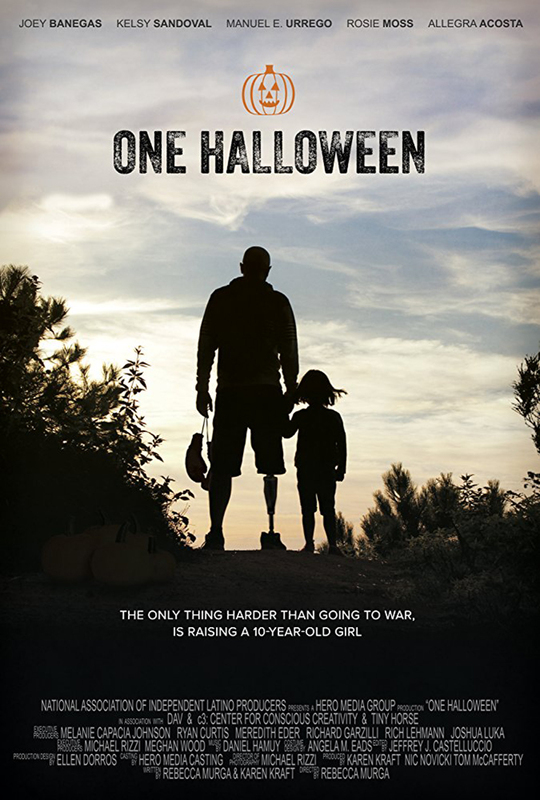 The only thing harder than going to war is raising a 10-year-old girl' ONE HALLOWEEN is a short film that follows a Soldier, played by wounded warrior and bronze star recipient Joey Banegas, through one Halloween night as he tries to connect with his 10-yearold daughter after returning home from the war. This short film features three wounded veterans of the Iraq and Afghanistan wars who were injured in combat. As the two find out how to be father and daughter again, they learn lessons about friendship and family. The most poignant part of One Halloween, A San Diego Film Festival featured short, is the first two minutes. As we watch Joey (real life veteran Joey Banegas) go through the motions of attaching his prosthetic limb for the simple task of answering the door, you can’t help but think of how many men and women out there sacrificed to meet this same fate. It makes the movie all that more emotional when the neighbors children, void of manners, represent the callous part of those that don’t care. Joey tries his best to connect with his teenage daughter Sandrita (Allegra Acosta) as they both navigate through his return to civilian life. Joey, picking up on his daughters difficulty coping, plans a trick and a sweet bit of revenge on the neighbors disrespectful children, along with a bit of help from his fellow veterans. It’s not the trick itself that drives home the heart of the film though, it’s the dinner after, as the veterans sit around and banter back and forth in a way that only family formed among war’s ashes can. One Halloween translates to the audience exactly as it was meant to, a passionate work based off the director/writers own experiences. Director Rebecca Murga takes a step towards broadening representation for those rarely seen like this in film, and that in itself is verification that it needs to be seen. Create a character page for: Create » ?